Introducing your skin savvy best friend: the latest blemish-busting hygiene bar, Dettol Eventone™ Aloe & Avo. Packed with deeply nourishing super fruit, this premium soap bar is used for the whole body. That’s right, your whole body! It fights germs, gently exfoliates, and washes away blemish-causing oil and dirt. The result is an evenly toned, blemish-free, deeply nourished complexion for an even better you. 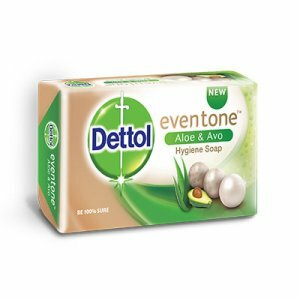 Click here to leave a review for Dettol Eventone™ Aloe & Avo Hygiene Soap. "This amazing new product on the shelves is nothing less..."
"I'm totally loving the new Dettol eventone with avo and..."
"I've been using the Dettol Eventone Beauty bar for 2..."
"I’ve been using the new Dettol Eventone soap for two..."
"Been using Dettol eventone for 2 weeks now and i..."
"Very effective and evens skin in a few days. It..."
"This product is great for people who want even-tone skin..."
"This product exudes freshness and cleanliness with the added benefit..."
"This soap not only leaves me feeling squeaky clean due..."